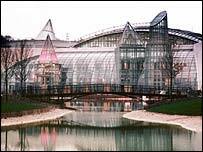 Bluewater shopping centre enjoyed a sharp rise in visitor numbers on the first weekend since it banned youths wearing hooded tops and baseball caps. Some 23% more people visited the Kent mall last weekend than during the same weekend in 2004, the centre claims. Managers introduced a code of conduct on 11 May aimed at clamping down on anti-social behaviour at the complex. It also outlawed swearing. Prime Minister Tony Blair later expressed support for the move. A Bluewater spokesman said that after extensive customer research, a decision was taken to clamp down on intimidating behaviour by groups or individuals, swearing, and the wearing of clothing which deliberately obscures the face such as hooded tops and baseball caps. He said shoppers would feel more comfortable in an environment where anti-social behaviour was taken extremely seriously. The new rules also prohibit smoking, leafleting, or canvassing on site. He admitted the hoodie ban had received an "extraordinary" amount of publicity but this would not, on its own, necessarily account for the increased trade. "Footfall is notoriously fickle and affected by a variety of factors including weather, the economic climate and marketing activities," he said. On BBC Radio 4's Today programme, correspondent Nick Cosgrove said the rise in visitor numbers was "all the more remarkable considering the extremely tough trading environment on the high street". "Given [the ban's] almost overnight impact on attendance, other shopping centres across the UK will be taking a greater interest in making a similar move," he added. The Children's Society charity branded Bluewater's ban "blatant discrimination based on stereotypes and prejudices", and said it infringes young people's rights. But Bluewater insisted its code of conduct was not "children-specific".